Discovery remains on track for an opening launch attempt on February 24, as the stack is put through S0009 Launch Pad Validation task out at Complex 39A. No issues have been reported, as preparations pick up for the Delta Flight Readiness Reviews (FRRs) – which continue to show a clear path towards the required flight rationale on the External Tank (ET-137) stringers. Discovery departed the Vehicle Assembly Building (VAB) on Monday evening, with first motion recorded as 19:58 local time, prior to arriving at Pad 39A – with hard down recorded at 02:53 on Tuesday morning. The vehicle was covered by the protective Rotating Service Structure (RSS) at 05:54. As per usual for the initial pad flow, the stack is being put through numerous mating and leak check procedures between the pad and the vehicle. “OV-103/SRB BI-144/RSRM 112/ET-137 (Pad A): S0009 Launch Pad Validation: LH2/LOX system functional test and checkout was completed Wednesday. PRSD (Power Reactant Storage and Distributation) system checkouts were completed Wednesday,” noted the latest NASA Test Director (NTD) report (L2). “MPS (Main Propulsion System) temperature transducer R&R (Removal and Replacement) was completed Wednesday. Mass spec leak checks are scheduled for Friday. IMU (Inertial Measurement Unit) calibration was completed Wednesday. Preparations for next Monday’s Hydraulic Power Unit (HPU) load on the Solid Rocket Boosters (SRB) are also picking up, with no additional Interim Problem Reports (IPRs) – common for a pad flow – reported by the NTD for the entire stack. Most IPRs during a pad flow are usually related to Ground Support Equipment (GSE), as opposed to the orbiter herself. While Orbiter Mid Body Umbilical Unit (OMBUU) mate/leak checks, ET camera functional test, SSME (Space Shuttle Main Engine) Ball Seal leak checks and Ground Umbilical Carrier Plate (GUCP) leak checks are scheduled for Friday, engineers have already hooked up the vent arm between the Fixed Service Structure (FSS) and the tank, prior to taking alignment measurements. STS-133’s November 5’s launch attempt was scrubbed due to a breach of the HAZ-09 limit in the Launch Commit Criteria (LCC) via a large gaseous hydrogen leak during tanking, caused by a misalignment of the Carrier Plate – which has since been corrected, along with the replacement of the system’s two part flight seal. 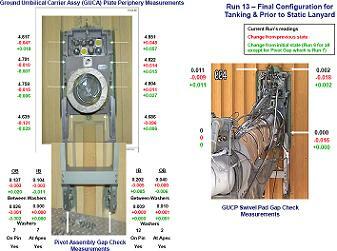 The GUCP performed as advertised during the December 17 tanking test, which provided a free test of the system during what was an investigation into cracks observed shortly after the scrub, when pad cameras scanned the tank during the draining of propellants. 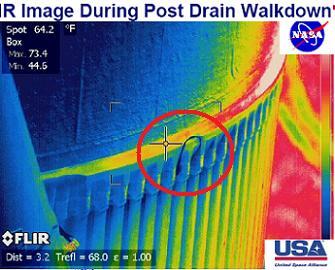 However, it is believed that Infra Red footage showed the initial crack on the tank’s Thermal Protection System (TPS) – located on the LO2/Intertank Flange region – “pop” slightly during the actual tanking, when the tank was under a pressure cycle. With a large, multi-center, effort undertaken to find the root cause into what turned out to be several cracks on two separate locations of ET-137 pinpointing the problem, the required flight rationale is set to be approved at the upcoming SSP (Space Shuttle Program) and Agency Delta FRRs. A positive outcome at the FRRs continues to be projected by the Failure Analysis Team (FAT), which has completed the majority of the testing and data analysis required to support the flight rationale for ET-137. 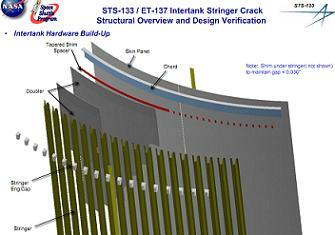 The FAT have conducted exhaustive testing on the stringer materials, aided by a surprise find of a crate full of spare stringer material from the ET-137 build – which has provided additional “bend tests” on what has been observed to be reduced fracture toughness on stringers which are deemed have a “mottled” appearance. The team have also tested the stringers with the radius block modification in place, showing the addition – installed on the majority of ET-137’s stringers – provides the required mitigation against further cracks, both during tank loading, and importantly during ascent. Mitigation against foam TPS cracks on the area of the tank removes the potential threat of a crack liberating large pieces of foam, which provide the threat of a debris impact on the orbiter’s heatshield during the ride uphill. Aided by stringers taken from the spare tank (ET-139) at the Michoud Assembly Facility (MAF), the team believe the structural test series has properly demonstrated the radius block repair performance across the full representation of stringer material behavior – a central element of the flight rationale. With STS-134’s tank – ET-122 – now being prepared for radius block installations inside the VAB, the findings from the ET-137 investigation – along with work from the Subsystems and FAT test findings – will provide a baseline of flight rational for Endeavour’s April flight. Present status shows the required scaffolding access around the intertank on ET-122 has been completed, incorporating the lessons learned from ET-137s mod work. Foam removal for the mod is expected to begin today (Thursday), in preparation for the arrival of specialist MAF technicians for the opening mechanical work.